18 Aug 2005 @ 13:01 by jstarrs : There's a whole cult that surrounds him. ..I think he's a fascinating figure, a giant in the film world. He was also a professional dancer before acting and still tries to have at least a small cut in each of his films where he dances. Don't forget we've already had one president and a governer issued from Hollywood! And how about Sean Penn as Vice Pres? 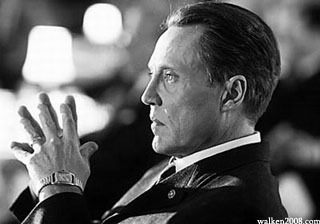 I WOULD LOVE TO SEE WALKEN RUN FOR PRESIDENT. HE's GOT MY VOTE!!!!!!!!!!!!!!!!!!!!!!!!!!!!!!!!!!!!!!!!!!!!!!!! As a brilliant actor, and one of my favorites, he would make a brilliant leader. Yep he has my vote too. Wait lets see: im 14 and 3 years from now in 2008 i would be 17..ooo.. **** Alright he definetely has my parents vote if he was running. I mean he would be a great president because hes a great actor. I'm going to vote for him wether he's on the ballot or not. Here! Here! Tom. It will be my first vote and I definately will be doing a write in! To Ming the Mechanic: I just read your comment. Is it really true that it's just a hoax? I seriously believed, even to the point of printing up some flyers to put up on my van. I would vote for him, he's great to look at and at his state of the union speeches, I'd be glued to the tv just to hear that voice. You know, an actor did the job before quite well (Reagan) and we could use one in there like Walken, especially with the looks he can give that say "dont mess with me" yah don't believe we'd have any problems other countries. Walken for President!!!! !It has to be true.